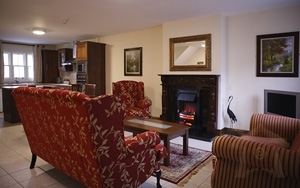 Each of the 15 newly-built Bord Fáilte four star, two bedroom ensuite lodge sleep up to 5 people. They enable an additional 75 persons to be accommodated overnight at Ballykealey and ensure peace of mind for those travelling long distances to weddings. The facilities in our Guest Lodge include iron, washing machine, television, kitchen and ensuite bathrooms. 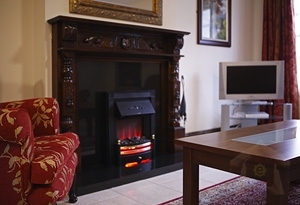 All Guest Lodges are centrally-heated and have a flame-effect fire in the spacious living room area.